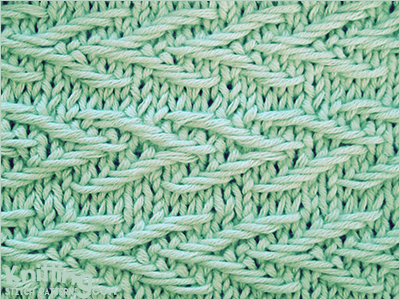 Knitted in a multiple of 10 sts + 2 and 26-row repeat. Row 1 (Right side): K1, * k2, sl 3 wyif; rep from * to the last st, k1. Row 2: P1,* p1, sl 3 wyib, p1; rep from * to the last st, p1. Row 3: K1, * sl 3 wyif, k2; rep from * to the last stitch, k1. Row 4: P1, sl 1 wyib, p2, * sl 3 wyib, p2; rep from * to last 3 sts, sl 2 wyib, p1. Row 5: K1, sl 1 wyif, k2, * sl 3 wyif, k2; rep from * to last 3 sts, sl 2 wyif, k1. Row 6: P1, * sl 3 wyib, p2; rep from * to last st, p1. Row 9: As Row 3. Row 14: P1, * sl 3 wyib, p2; rep from * to last st, p1. Row 15: K1, * sl 1 wyif, k2, * sl 3 wyif, k2; repeat from * to last 3 sts, sl 2 wyif, k1. Row 16: P1, sl 1 wyib, p2, * sl 3 wyib, p2; repeat from * to last 2 sts, sl 2 wyib, p1. Row 17: K1, * sl 3 wyif, k2; rep from * to the last stitch, k1. Row 18: P1,* p1, sl 3 wyib, p1; rep from * to the last st, p1. Row 19: K1, * k2, sl 3 wyif; rep from * to the last st, k1. Row 20: As Row 18. Row 22: As Row 16. Row 24: As Row 14. One thing to pay attention to in the pattern is making sure you slip your stitch purlwise, so it doesn’t change its orientation from one needle to the next.